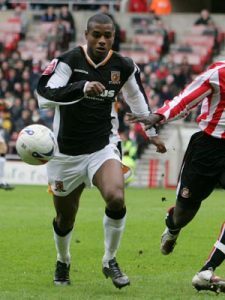 Portuguese forward Vaz Te was signed by Phil Brown on a short term loan to add momentum to City’s climb up the table during the Spring of 2007. Vaz Te showed little interest in performing for the Tigers, nor for his former assistant boss at Bolton, and after a shocking performance at Wolves he returned to his Lancashire base. Vaz Te was born in Portugal capital Lisbon but spent the first 11 years of his life in Guinea-Bissau. He returned to Portugal to embark on a youth team career but switched to Bolton Wanderers at the age of 17. During seven years at Bolton he played only 60 times, mostly as substitute. In 2010 he headed east for a season in Greece, before returning to British shores and signing for Hibernian. A season at Barnsley re-established his goal scoring prowess and he spent a subsequent three years at West Ham United. Two spells in Turkey and a season at Charlton followed, and in 2017 Vaz Te signed for Chinese Super League Hinan Jianye. Vaz Te was capped by Portugal at all youth levels from Under-17 to Under-23, but was never selected for the senior squad.